Sharing the good news of the gospel isn’t simply a suggestion. It’s a command that Jesus set out for us: to be the catalyst for eternal heart change in our neighbors and throughout the world as we share God’s Word with others. Romans 10:14 says, “How, then, can they call on him they have not believed in? And how can they preach unless they are sent? As it is written: How beautiful are the feet of those who bring good news.” This passage goes on in verse 17, “So faith comes from what is heard, and what is heard comes through the message about Christ.” We most clearly hear the message about Christ in Scripture, and so we know that discipleship does not occur apart from the Word. What a charge to be faithful in sharing God’s Word and the story that he has fulfilled through Jesus, of bringing those far from him into fellowship with him! For all who have experienced God’s saving grace, may God’s Word bubble out of you like a hot spring! After all, God’s Word is meant to be shared. I love that God gives us a promise, that when we obey and share, his Spirit will do the rest. We can rest in knowing that God’s Word will not return empty, but it will accomplish what God pleases (Isaiah 55:11). God could have found many conduits to deliver his message, but he chooses to allow us to join him in the work. It is an honor to be able to share the story of God’s grace and mercy that has been revealed to us in the Bible. May we love God’s Word so much that we cannot keep the good news to ourselves: this is one message we can share that never grows stale! “The grass withers, the flowers fade, but the word of our God remains forever” (Isaiah 40:8). And may we be found faithful to our Lord’s command. The goal of the Christian Standard Bible is to provide a translation that is highly accurate to the original and highly readable, so that it can be easily understood and shared with others. 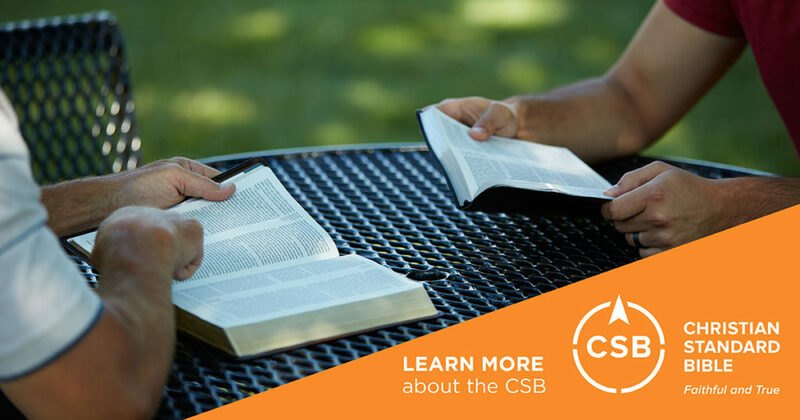 We pray that the CSB will enrich and equip you as you read the text and as you share God’s Word with your friends, family, and neighbors.